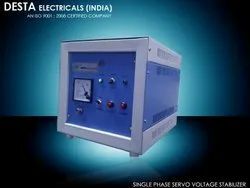 Our product range includes a wide range of automatic single phase stabilizer, single phase servo & automatic voltage stabilizer, 7.5 kva servo voltage stabilizer and air cooled servo stabilizer. Input Voltage 140 - 280 Volts. Speed Correction 15 to 25 Volts. / Sec. Continuous stable supply of Automatic Single Phase Stabilizer is the life line of any sophisticated and electrical system. The performance of these instruments is optimum at the rated voltage. Under voltage generally reduces efficiency, and very low voltage even can force the system to shut down. Input Voltage 170 - 280 Volts. Continuous stable supply of AC Power is the life line of any sophisticated and electrical & electronic system. 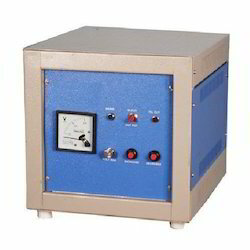 The performance of these instruments is optimum at the rated voltage. Under voltage generally reduces efficiency, and very low voltage even can force the system to shut down. High voltage shortens the life and even can burn the instrument. 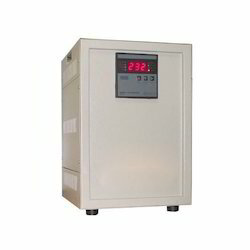 Desta Servo voltage stabilizer receive fluctuating AC voltage of wide range and delivers constant Output voltage with in ± 1%of the nominal voltage; it is therefore an excellent remedy for the problems of wide fluctuations. The efficiency is maintained as high as 95%& more. 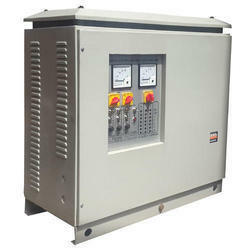 The output voltage stability of our servo stabilizer allows the optimum drawing of the current by the connected load and as such no extra power is consumed at low as well at high voltage. This therefore save electric power to approximately 20% and reduces MDI. Buck boost double wound transformer. Geared servo motor unit with limit switches to avoid over running at highest and lowest position. Microcontroller Digital display control card. These entire components are interconnected to form Servo Voltage Stabilizer. 95% and more efficiency being achieved by optimum design and by use of high quality CRGO lamination and 99.9% pure copper. Immune to load PF and supply frequency variation. Control through Micro Processor Controller/IC based solid state plug in type glass epoxy control Card. High quality EHV grade oil as per IS-335. Input Voltage: As Per Customer Requirement. Output Voltage: 230/240 /400 / 415 Volts. ± 1% Nominal. Front panel Adjustment with in ± 5% of Nominal Voltage. Input/Output Connection: Terminals of suitable rating. Correction Rate: 15-25 volts/ Sec. Suitability: Unbalance Input Voltage, Balance Output Voltage, & Balance/ Unbalance Load. Compatibility: Use with Mains and DG set. Environment: Designed for Indoor Tropical Use. Insulation Resistance: <6 Mega Ohms at 500V DC. Dielectric test: 1.5 KV RMS for 1 minute for the unit 2.5KV for the Power components. Visual Indications: Input, Output, Low/High Voltage, Time Delay, Mains ON, Low/High Voltage Cut-off. Response Time: 10 m sec. Control: Through Micro Controlled Digital Circuit. Input Voltage 140 - 270 Volts. Output Voltage: 230/240 Volts. ± 1% Nominal. Front panel Adjustment with in ± 5% of Nominal Voltage. Suitability: Unbalance Input Voltage, Balance Output Voltage & Balance/ Unbalance Load. Speed Correction 15 to 30 Volts. / Sec. Visual Indications: Input, Output, Low/High Voltage, Time Delay, Mains ON, Low/High Voltage Cutoff.